CEC Training Courses – IICRC & RIA approved for CEC Credits. Each class is an approved event for IICRC and the RIA for Continuing Education Credits. Also, our courses are recognized by most provincial Insurance Associations for their Continuing Education requirements for Insurance agents, brokers and adjusters. Currently we offer 9 different half-day courses and 3 full day courses, with more being developed. We provide these CEC Training courses in two main formats: Public and Private Events. Private Events – are ones we usually do in a Contractors shop and they can either be just for the staff of the hosting company or often they also invite in their clients, such as Property Managers, Facility Managers, insurance agents, brokers and adjusters, etc. 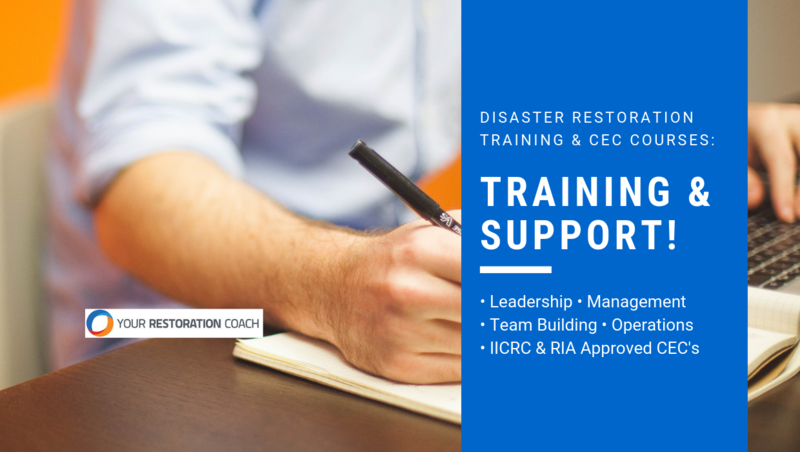 Your Restoration Coach Ltd. provides IICRC & RIA approved CEC Training Courses along with specialized Business Coaching and Advisory services for owners and managers of Disaster Restoration businesses. We help clarify your goals while helping you develop and implement action plans to achieve them! Contact Dan Murray today to find out more about our IICRC & RIA approved CEC Training to see where and when our next Public Events will be or to book your own Private Training events.